duPlooy's is a small jungle lodge in the Cayo District in Western Belize. The lodge offers plenty of activities right on their premises - swimming in the waters of the Macal River, relaxing on a beautiful sandy beach, canoeing, horseback riding or visiting the adjacent Belize Botanic Gardens. 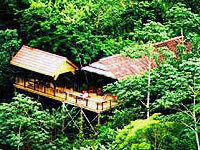 Bird watching can be done in a civilized fashion right from duPlooy's deck with its 200 feet canopied walkway. Join the resident bird guide each morning on the deck for complimentary coffee and tea and you will see such exotic birds as: mot-mots, toucans, trogons, tanagers, parrots and many more. duPlooy's offers a variety of rooms to suit everyone. All rooms have porches with hammocks, hot water, ceiling fans and screened windows. DuPlooy’s jungle lodge consists of bungalows, jungle lodge rooms (some with connecting rooms), La Casita and the Belize River House. There are many things to do in and around the area of duPlooy's Jungle Lodge. You can choose to go canoeing on either the Macal, Mopan or Belize rivers, visit some Mayan ruins, see some spectacular caves, go horseback riding across the Belizean countryside or even stay right here for the day bird watching, swimming or visiting Belize Botanic Gardens.